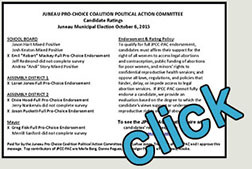 JPCC PAC's Voter Guide is published prior to Municipal and State elections. 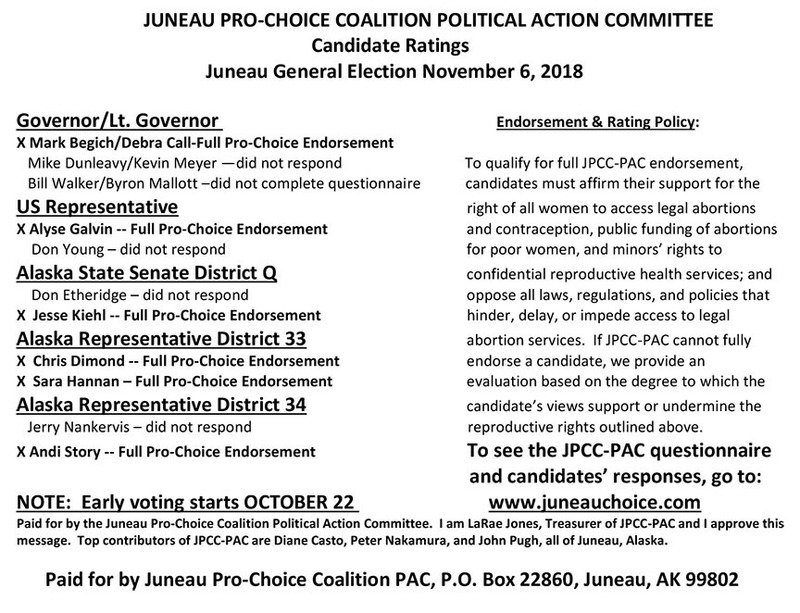 It is mailed to most Juneau voters. You can elect to recieve it by mail here or see it posted on this site prior to Election Day. The Voter Guide is based on candidate answers to our questionnaire [sample] and its cover letter [sample]. Why does it matter if our local elected officials are pro-choice? Our State Representatives and Senators deal with many bills aimed at curtailing our reproductive freedom. A few recent examples: parental consent for teens seeking contraception; parental consent for minors seeking an abortion; a constitutional amendment allowing public hospitals to deny abortion access on "moral" not medical grounds; so-called partial-birth abortion ban; and numerous other infringements on women's medical autonomy and privacy. In addition, pro-active efforts, such as a campaign to get contraception covered under insurance, need legislative support. The City Assembly oversees appointments to Bartlett Regional Hospital's Board. We believe that the hospital has a duty to the community to provide abortions, and we must have an open-minded Board. Furthermore, Assembly members can influence others, and they themselves often move on to hold higher office, where reproductive rights issues frequently arise. The School Board oversees the Teen Health Center, which has been a source of controversy from the outset. As a result, the Center is always under threat and is limited in its ability to address the needs of teens. We must maintain a Board that is committed to maintaining and broadening the scope of the Center's mission.